It’s a common train of thought that because Irish whiskey is, usually, triple distilled it is smoother than Scotch. How does triple distillation create a ‘smoother’ whisky, and is that the only process involved? Of course, The Whisky Professor has the answers. 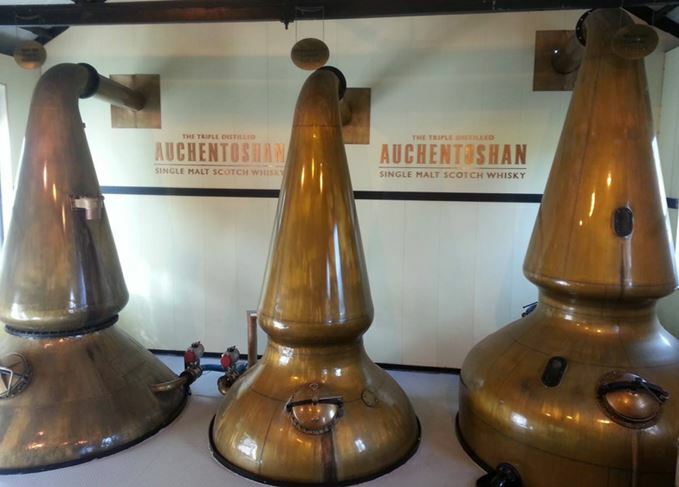 Triple distillation: Auchentoshan is one of a handful of Scottish distilleries that shun the traditional two-still set up. Last week I was out with friends for our regular Thursday night social, when I ordered my usual drop of Speyside single malt. My friend, who is not really much of a whisky expert, advised me I should be drinking a glass of Irish whiskey, it being St. Patrick’s Day and all. He had a point, and I’m all for experimenting, so I obligingly switched my allegiance for the evening. Now, I’m not too familiar with Irish whiskey, but I find it to be much smoother and easy-going than anything I’ve had from Scotland before. My bartender friend said that’s because Irish whiskey is triple-distilled, but how does that make it smoother? What is it about triple distillation that makes it appear smooth? The Whisky Professor reveals the truth. This is a common question that has a tendency to be rather contentious. Let’s start with what you perceive to be ‘smooth’, which is a term generally used to describe a whisky that has little burn on the finish. Smoothness is often associated with a light style of whisky, but the two shouldn’t be confused. Some light-flavoured whiskies can be harsh, while some heavy, robust whiskies can also be smooth. There are a number of factors that can contribute to smoothness, but fundamentally it’s all down to the number of congeners and impurities in the spirit. Congeners are flavour compounds present within a spirit that are usually created by the yeast during the fermentation process. They also develop and change during distillation and maturation. There are hundreds of congeners that impart different flavours in your whisky, and some are more powerful than others. During the distillation process the distiller has an opportunity to keep or remove these congeners depending on the style of whisky they want to make. Not all congeners taste great, particularly not in large quantities, so they are removed from the system. One way of doing this is through increasing the amount of reflux in the still. In double distillation, as the liquid in the still (the wash, which is comprised of water, about 8% alcohol and congeners) boils, the alcohol and flavourful congeners will separate from the water, vaporise and travel up the still into the condenser where they are collected before being distilled once more in the spirit still. The aim is to eventually concentrate the alcohol to around 70% abv. Depending on the size and shape of the still, some of this vapour hits the copper sides of the still, condenses and falls back down into the boiling liquid. Each time this happens the vapour is essentially being redistilled, each time separating out more congeners and impurities that are left in the water below, and becoming a lighter spirit – this process is called reflux. The most volatile congeners such as high alcohols and esters, come off the still first as the foreshots (heads). The least volatile congeners are the last to distil, and come through toward the end of the process as the feints (tails), so where the distiller makes their cut points is also vitally important in creating a spirit that is light and smooth. So to create a lighter new make spirit in the first place, the distiller first needs to increase the amount of reflux in the still to remove congeners, and maintain a tight control over cut points. Reflux can be increased with the use of large stills, as well as additional features such as boil balls and upward lyne arms. The bigger the surface area and more difficult it is for the vapour to travel into the condenser, the greater the reflux will be. Another way to increase reflux is to increase the number of distillations the spirit goes through. This is where triple distillation (and even column distillation, but that’s for another day) comes into the picture. By adding an intermediate still in between the wash and spirit stills, the distiller is able to drive up the level of reflux to separate out those unwanted flavour compounds. By adding in a third still there is also more copper contact with the spirit, which leads to the removal of heavy, sulphur-containing compounds. While the Irish are well known for triple-distilling their whisky, the majority of Scottish distilleries traditionally double distil their spirit, though some Scotch whisky is triple distilled too. The best known example is Auchentoshan in the Lowlands, while Campbeltown’s Springbank distillery triple distils for its Hazelburn malt. Each distillery’s process is vastly different though, and even Ireland’s distilleries have their own unique process, but for ease I will succinctly explain a standard approach. The fermented wash (about 8% abv) is distilled in the wash still. The distillate, now called the low wines, is about 25% abv and is held in the low wines receiver. It is then mixed with the tails from the preceding low wines distillation and distilled in the intermediate still. This intermediate distillation is then split into two parts: strong and weak (those tails). The latter will be mixed with the next lot of low wines and redistilled in the intermediate still. The strong portion is taken forward to be redistilled in the spirit still. This runs as normal, with the heart of the run [new make spirit] being separated from the heads and tails, which are redistilled in the spirit still. Every time the spirit is distilled it becomes stronger in character. Rather than the average strength being at 70%abv, as in double distillation, triple distillation will produce a spirit which is closer to 80%abv (Auchentoshan, for example, collects at between 80 and 82.6%abv). This also then has an impact on flavour. The stronger the spirit, the lighter its aromatic character will be. To confuse things further, triple distillation doesn’t necessarily result in a light and ‘smooth’ spirit – Mortlach for example is well on its way to being triple distilled (x2.81), but has a heavy, meaty and rich character. More on Mortlach’s complexities here, because of the specific nature of its process. While we’re talking about ‘smoothness’, we must mention the importance of good quality, first-fill casks for maturation. These will also help create a smooth spirit by subtracting volatile components left in the spirit through the cask’s charred layer, and adding flavours of its own such as vanillin, a sweet compound that contributes toward this perception of ‘smoothness’. The importance of maturation is another question I answered not long ago. Do remember that triple distilled Irish whiskey – some Irish whiskey is double-distilled – is different in character to single malt Scotch but that does not mean it is devoid of flavour, as you will have discovered on St. Patrick’s Day. I like to recommend a triple-distilled Irish blend to beginners just embarking on the first steps of their whisky journey as it can often be the most accessible. The light spirit obtained through triple distillation blended with soft grain whiskey can be delightfully smooth. Although that is just my humble opinion; ‘smoothness’ is certainly subjective.